The paper consists of 225 multiple choice questions with four options available for each question. Physics, Chemistry, Biology and Computer Science. Mode - GCET 2019 is conducted in an offline (Pen & Paper based) test. Duration - The total exam duration is 6 hours. i.e. 2 hours each subject (Physics, Chemistry, and Mathematics). Paper Pattern - The paper comprises of 225 questions (75 questions for each subject) with four choices accessible for each question i.e MCQ based test. Marking Scheme - For every correct answer (+1) Mark is awarded to the candidates and there is No Negative Marking. Language/ Medium - GCET/ GOA CET 2019 Question Paper will be only in English Medium. Candidates are advised to reach the examination centre before an hour to the scheduled time. 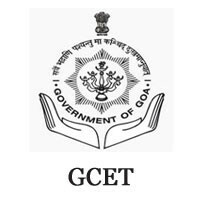 Applicants must bring their GCET/ GOA CET 2019 Admit Card with them in order to enter into the examination hall. Applicants will be permitted to take the duplicate of the OMR sheet after the exam is finished. After the appropriate response key is distributed, hopefuls can utilize the same to think about and appraise their scores and chances for affirmations. Is there any negative marking? If yes how is the final thing calculated? There is no negative marking. Each paper shall consist of 75 questions of one mark each with no negative marking.